“Stephanie Blythe & Friends,” a concert presented on August 10 at Tanglewood’s Florence Gould Auditorium, Seiji Ozawa Hall, provided an opportunity to experience one of the most beautiful and powerful voices of our time as it transformed even the most familiar music into a sublime experience. Blythe has quickly become a regular on the Boston music scene, and her amazing voice combined with her gracious enthusiasm have gained her many treasured colleagues and collaborators as well as fans. Among them is composer and pianist Alan Smith, who contributed two substantial works to the evening. His song cycle Vignettes: Covered Wagon Woman from the Daily Journal of Margaret Ann Alsip Frink, 1850, for mezzo-soprano, violin, cello, and piano was written in 2007 especially for Blythe. Smith’s talents as a composer lie firmly in the realm of storytelling; this set of eleven songs and two brief instrumentals expertly relates scenes from a Midwestern woman’s wagon trip to California during the days of the gold rush through an engaging use of instrumental timbres and varied melodic and harmonic constructs that steadfastly avoided cinematic cliché, cowboy kitsch, and Wild West romanticizing. Blythe’s delivery brought to life all sides of the narrator in a fully formed understanding of character and emotion, from her confident determination to her ability to marvel unguardedly at the adventure of it all. I wish Smith’s second work on the program, An Unknown Sphere for mezzo-soprano solo and unaccompanied mixed chorus, had achieved equally engaging heights. It seems that Walt Whitman’s poetry, while sublime, lacks the narrative impulse that brings out the best in Alan Smith’s vocal writing. The Tanglewood Festival Chorus achieved a nice, big sound and Stephanie Blythe gave all her expressive power to her solos. Nevertheless, the piece only offered a few remarkable moments within a predictably dull setting. In between these two pieces by Smith, the Tanglewood Festival Chorus performed Italian composer Luigi Dallapiccola’s Canti di prigionia (Songs of Prisoners), a mini-cantata for mixed chorus, two pianos, two harps, and percussion. The texts Dallapiccola chose, by Mary Stuart, Boethius, and Savonarola, three figures imprisoned and executed for largely political reasons, are centuries old, but this piece, written in 1941, gives them modern resonance. Despite a rather large percussion ensemble, Dallapiccola’s careful orchestration achieves constrained and dark timbres shot through with the piercing tones of xylophone and the delicacy of the harps, like shafts of light reaching to the depths of a dungeon. The chorus emerges from this texture with whispers and a slowly building line, immersing the listener in a world of suffering struggling toward revelation and release. The TFC, bringing the same attention to detail and clarity of expression to this modern work as is usual for standard repertoire, conveyed Dallapiccola’s juxtaposition of suffering and the ability to transcend it, in text setting ranging from passages reminiscent of liturgical chant to biting, modernistic polyphony. Each climax within the three movements united the chorus and the instrumental ensemble with a masterful sense of building and releasing of tension. Occasional snippets of the “dies irae” chant underline the religious impulses in the text. As Canti di prigionia progresses towards its conclusion, Dallapiccola’s music turns more and more toward the revelation of divine comfort and perhaps justice, bringing the piece to a point of epiphany tinged with tragedy. Stephanie Blythe closed the evening with arrangements of three traditional American songs: How Can I Keep from Singing?, There is a balm in Gilead, and Shenandoah. Each displayed the beauty of Blythe’s voice, but none so evocatively as her a cappella performance of How Can I Keep from Singing? ; her exquisitely sublime ornamentations brought tears to my eyes. How sweet, after such a rich musical journey, to be reminded of the straightforward power of an unadorned yet gorgeous voice. Lovey and I are hearing that the BSO is close to making a big announcement regarding a music director and some people will be “le stunned” s’il vous plait and others will be even more stunned. 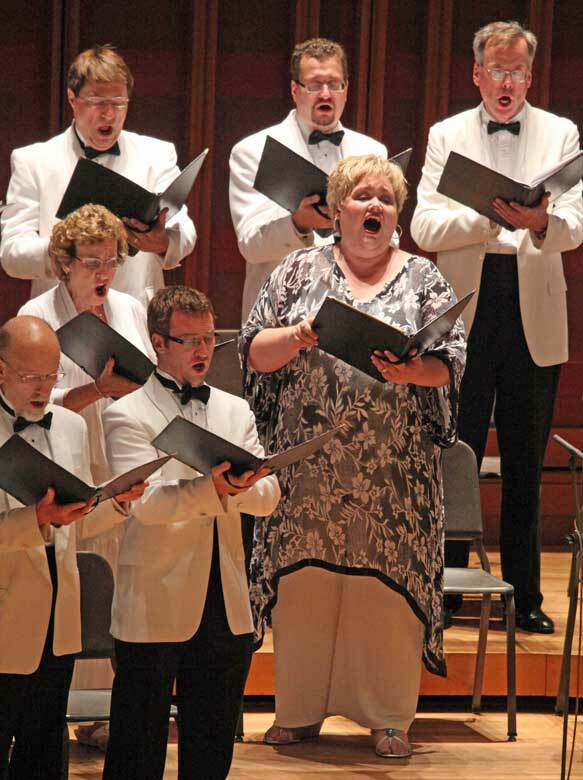 Was there a conductor for the Tanglewood Festival Chorus? If so, wasn’t he/she worth mentioning? If it weren’t for his age, I’d have considered him a leading contender all along. He’s certainly been around the orchestra a lot over the past several years — the go-to guy when a substitute is needed. Obviously management must have a good opinion of him. At the very least, such an appointment would buy time for an unhurried search for his successor, since he can’t be expected to stay for 25 years. For the record, the conductor for the Dallapicola and Smith “Unknown Sphere” was John Oliver, founder and conductor of the Tanglewood Festival Chorus. Also, it’s worth noting that the Smith was a world premiere, commissioned by the BSO for the Chorus’ 40th anniversary. *** Are you thinking of Maestro Frühbeck? The Thurston Howell’s words did make my tail trembling. The Maestro Frühbeck? In my view it would be unfortunate. Over numerous concerts that Mr. Frühbeck did in Boston there were very memorable events. He is for sure is a wonderful person and does his best but in my estimation Boston need an injection of a new blood. We do not have such a great BSO state for the last 5-6 years that we could let it slide on inertia. The last Frühbeck’s concert with Tanglewood Festival Orchestra the orchestra played truly phenomenally Brahms Second. Nope it was not such a great reading by Mr. Frühbeck and not as clean play but rather the stunning enthusiasm of the orchestra’s students to play, the enthusiasm that BSO demonstrate once in a few years. It would be fun if a new musical director would bring back the enthusiasm to BSO, the enthusiasm that BSO severely lucks. BTW, this is why Tanglewood Festival Orchestra and Boston Philharmonic with their semi-armature players routinely demonstrate more inspiring play then the pompous BSO. Alors, one should pay more attention to the BSO press releases in this regard, peut-être? I interpreted Mr. Howell’s comment as a suggestion that a Frenchman was under consideration. Dutoit is not French- must be someone else. Maybe Mr. Howells just meant a francophone or a franconym?